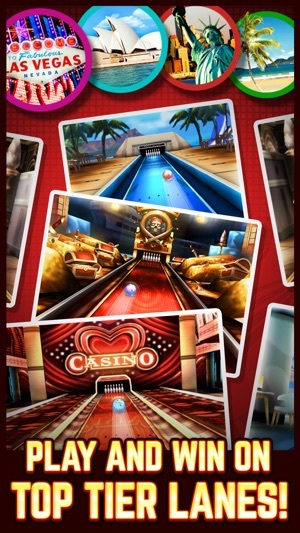 - Fantastic Bowling alleys around the world : Las Vegas, New York, Sydney, Paris and more! - Gorgeous 60+ Bowling Balls, 27 Pins & Lanes to show off your class. 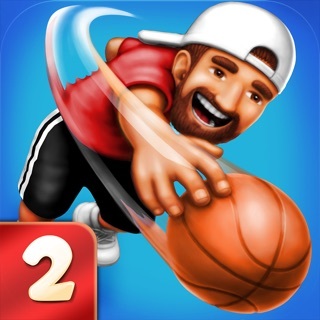 - 1-on-1 Mode : Real-time and speedy 1-on-1 multiplayer match! 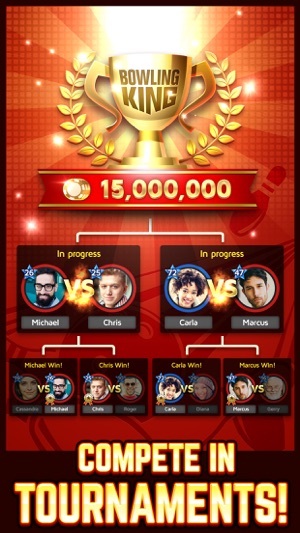 - Tournaments: Multiplayer tournaments matches to win millions of chips! - Challenge Mode : Clear a variety of stages and take rewards for free! 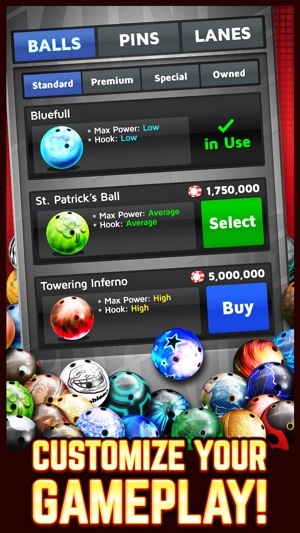 - Play with your friends : Bowl together with your friends anytime anywhere! - Mini Games : Slot and Roulette chances! - 5 Rankings are ready for you to rise through. - Multi Language support : English, Spanish, Portuguese, French, German, Italian, Russian, Turkish, Japanese, Chinese and Korean. This update includes improvements that will provide you with a better gaming experience. We constantly strive to make our games better, so your feedback is always welcome. Thank you for playing Bowling King! I am giving this a five star review so my review can be seen. As I was playing, I noticed that I was not receiving my winnings in Trick Shot mode upon the other player disconnecting. I never even received a refund, I just completely lost the amount of chips covering the entry fee. By the time I realized this was happening, I had already lost over a million chips and as of right now, I don’t even have enough chips to play in some of the most inexpensive areas that I should have been able to afford with ease. I love the game, don’t get me wrong because there are not too many games out there that are both addictive and actually fun at the same capacity. I actually considered paying real money in order to contribute to the game I have spent so many hours on end playing. However, if I must continue to lose even as I win game upon game, I no longer see a point in keeping the game on my phone. Once that issue is fixed, I will reconsider my rating on a true five star capacity and perhaps even my resolve towards making a monetary contribution towards the continued development for Bowling King. This game needs a lot of work. At first when I started playing this game I noticed real quick that you did not have total control of your ball that you roll. As you play the game and advance to higher levels , you get better so the app matches you with others who have similar averages. 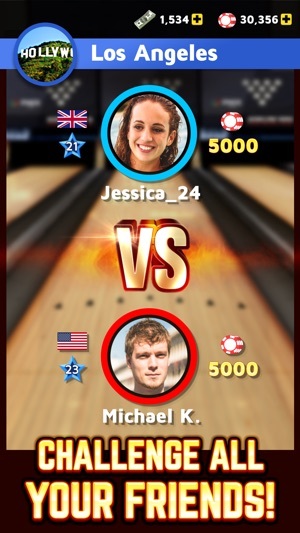 When you both ( you and your opponent) Start bowling perfect games the app will let the both of you do so once in a while but for the most part , you or your opponent will lose. 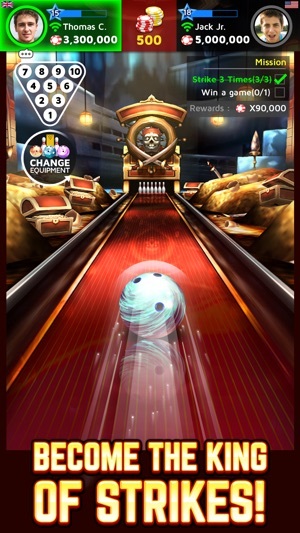 The same ball that you have always rolled and you got strikes with now you will only pick up 8 or 9 pins. Don't know if this app has been hacked((but I believe it has ) there are certain people who you will play and you will quickly recognize who they are , that no matter how you bowl you will not have total control of your ball and they will always win the game. Not all but most of them will talk to you by typing words that you do not have access to. Be aware. Makers of app have been aware of problem but don't seem to fix. Maybe it's because they are behind it? Just saying! For this reason of fixed or/ and hacked game I can only rate this game a 1 on the star rating. And that is a shame because this game has the potential to be a 5 star game. Highly recommend downloading this. Game is very addictive. Each match is just the right amount of time. Quick, fun matches that leave you wanting more. Also, if you don't want to spend actual money on upgrades, you can earn currency by working your way up playing the game. Graphics are pretty good for a phone. My only two complaints are some of the challenges are really hard, and strikes are really easy to hit. Challenges --They want you to zig zag a bowling ball around columns??? This is made worse by the fact that they never teach you how to preform a trick shot. And even when you figure out how to do it, it's still really hard. Maybe I missed a tutorial somewhere. If so, I'll edit this review. Easy strikes--You would think getting easy strikes would be great. And it is.... but it gets frustrating as hell when you play someone and they hit strike after strike. I bowled a perfect game probably a week after downloading it. Getting a turkey is way too easy. Overall-- a really fun game that pretty much never gets old.